The AIDS Awareness Education Cell was started in the year 1999 with an objective to bring about an awareness on prevention of AIDS and care of AIDS victims in and around the College and thus contribute towards a value based lifestyle for a better tomorrow. The Youth Red Cross conducted an orientation programme for the newly joined members on 23rd June, 2018.The Staff Coordinator Mrs Prajwal Rao briefed the students about the origin and historical outline of Red Cross and motivated them to take part in all the activities of the Association. Quiz on “Red Cross” was organized for the members on 7th July, 2018.Aspects such as the origin of Red Cross, historical outline, the objectives, important days observed, etc, were included. Importance of Antidrug addiction was made known to the students 4th August, 2018.The staff coordinator briefed the students on the importance of “International day against drug abuse and illicit trafficking”. Various aspects like types of drugs, their psychological effects on the youth due to drug abuse, various disorders associated with over usage of alcohol, nicotine, cannabis, tobacco, opium etc was explained to the students. Slogan writing competition on the topic ‘Importance of Blood Donation” was organized for the members of the Cell 1st September, 2018. The members of the Cell were actively involved in group discussion, watching inspirational movies ,Seminar presentations, Role play on topics like Social Awareness, Care of the girl child, Health and hygiene etc during the entire year. The students are trained in basic skills of music and introduced to various musical instruments of the Band. The association aims to attune the minds of students towards appreciation of good music by forming a band of students to sing for various programmes of the College and provide opportunities to showcase talents of students in music and singing. 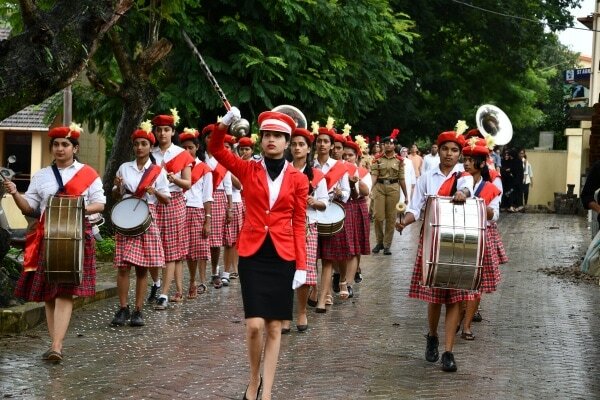 They are guided by experts and all major programmes begin with the striking up of a lively note by the College Band. They acquire and develop a sense of discipline and responsibility towards Fine Arts. The College band consists of 28 members, under the training and guidance of Mr. Vijay Olivera the Band Master. It is played for various Programmes of the College during the course of the year. The first year students were introduced to the band association. Ice breaker session was conducted for the 1st and 2nd year students on 30 June,2018. Mr Vijay Olivera the Band Master addressed the students on various band instruments and the instruments were allocated to the students on 7th July,2018. The Band was played for the cabinet inaugural at the P.U Auditorium on 10th July,2018. Final year, second year and first year students were present and was lead by Mr. Vijay Olivera. Students were taught the music notes and prepared the students to answer Preliminary Examination of Music Notes on 27th July,2018. Cooking without fire competition was organized for the band students on 4th August,2018.Students actively participated in the competition. Mrs Nimitha K, HOD of Commerce Department and Ms Froidy,Assistant Professor from the Department of Botany were the judges. Evanne and team won the first place, Ashel and team won the second place. The photography competition was organised for Band students on 25th August,2018 and the competition was based on the theme Nature .20 students actively participated and this competition was judged by Ms. Josline Dsouza and Mr. Wilson Mascarenhas who are into the photography world. Team 2 won the first place, Team 3 won the second place and Team 1 won the third place. The band practices were organized at the NRSC Grounds for Sports Day Preparation. The students are provided with opportunities to discover and enhance the talents of music and singing through various college events. Sweet melodies and harmonious singing add charm to the routine of academics. An orientation programme was conducted for the first year students of the college choir association on 23rd June, 2018. The Secretary gave an introduction about the college choir, objectives etc . The Second year students welcomed the first year students to the association with a short programme on 30th June, 2018. The association was divided into four groups and the secretary and two other representatives conducted a group activity on 7th July, 2018. The students of the association sang prayer song for the inter-class dance competition on 21st July, 2018 and became a part of it as audience. An activity was organized to make aware of the different hymns that can be sung for various occasions on 4th August, 2018. Group activity was conducted to make them aware of how opportunities that we receive should be utilized on 11th August,2018. 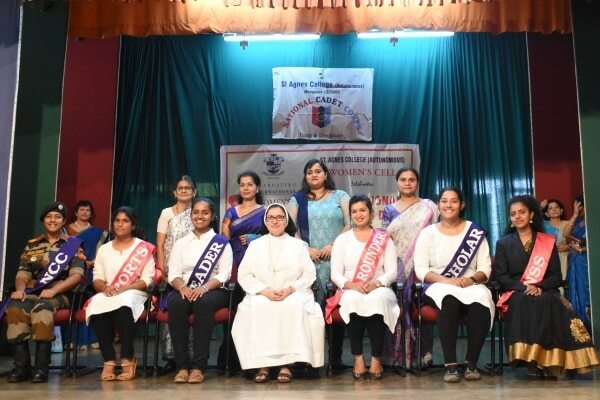 Patriotic singing competition was held for the college choir association members on 1st September,2018 Sr Linet Maria A.C,lecturer at St Agnes special D.Ed and Ms Simanthini Fernandes, Lecturer at St. Agnes College (Autonomous), from department of Computer Application were the judges for the competition. Group 3 secured 1st place and group 4 secured 2nd place. Two student representatives of the association organized group wise quiz on music and singing competitions on 15th September,2018. The main objectives of the Commerce Forum are to train the students to develop their organizing skills, to enhance their communication skills, create awareness and enlightenment about the current events and issues of Indian Industry and Commerce. The students also inculcate the spirit of social responsibility and good citizenship. 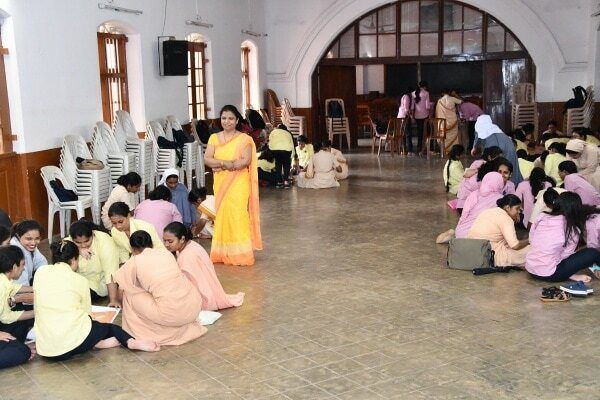 The commerce forum of St Agnes College conducted the following activities during the year to help our students exhibit their talents and ensure their all round development. The students were introduced to the commerce forum and its activities. They were oriented as to what they would gain from the commerce Forum. The students also had to introduce themselves to each other. The students were divided into 2 groups and they had to draw and guess the names of different products, which gave them knowledge about both old and new products in the market. The students were divided into 2 groups and they got an opportunity to speak and give their opinion and to take part in an active discussion. The quiz was based on products, new companies and logos of different companies. Various topics based on the environment and Commerce was included and the students got an opportunity to give their ideas and opinions. Students enacted and guessed various products and advertisements. Students were shown inspirational videos and creative Advertisements. The students were divided into 2 groups and were made to play games that were based on teamwork. The students were divided into groups and were given puzzles to solve. Students are exposed to the various technical know-how of computer facilities and learn the dynamics of computer. The club aims to improve analytical and logical skills among the students. They bring out the newsletter of the department. Microsoft Word – Introduction, creating a new document, changing font colours and styles, text alignment, bullets and numbering, inserting borders, clip art pictures, shapes, creating a table and saving the document. Microsoft PowerPoint – Creating a blank presentation, adding new slides, applying design templates, inserting images, adding text, applying slide transition and custom animation effects. A PowerPoint Presentation competition was also held that enabled students to display their creativity and ideas. Windows Movie Maker – Adding titles, credits, images and applying effects to create a short video. Various projects on the topic “Technologies”were given to the students. The Harmony Club was initiated in the year 2006, to spread peace amongst all, and to widen the knowledge of different cultural and religion practices across geographies through interfaith prayer sessions, discussions and other peace promoting programmes. The forum provides a platform for training in management and related issues. It helps to develop management and leadership skills among students. 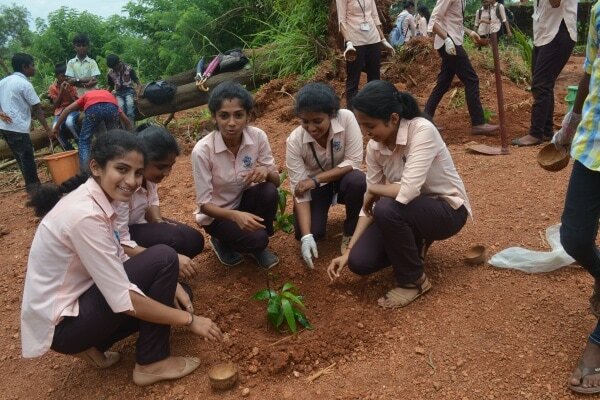 The Nature Club seeks to bring about environmental awareness in the college campus and in society, through its activities. The members will have the opportunities to study the environment and understand the need to conserve nature’s bounty. 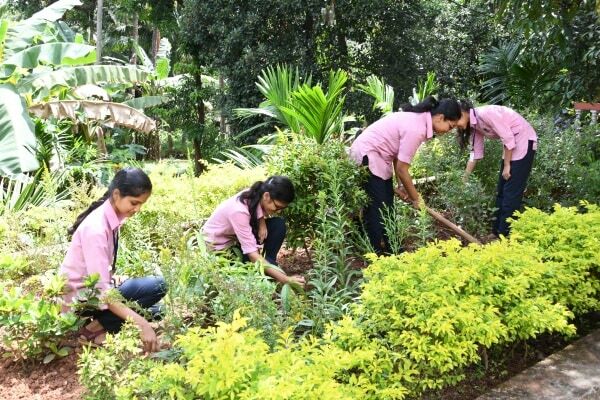 The herbal garden in the campus was cleaned by the members by removing the weeds and other waste material on 30th June,2018 The members were divided into groups and in rotation groups were assigned duties week wise to clean and maintain the herbal garden. Environmental Week was celebrated from 2nd -7th of July 2018Prayer was conducted by the members over the PAS for the week, theme being “Save Nature” Creative Painting competition on the topic “Soil and Nature” on 7th July,2018. 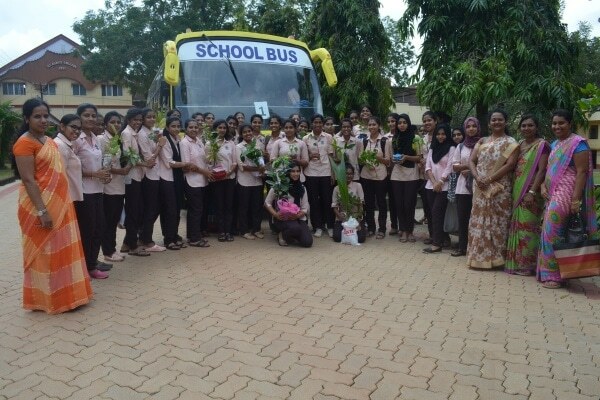 Distribution of plants to staff and students of the campus during the week. The saplings were collected from the forest department of fruiting and flowering trees and distributed during the week. The vermicompost unit of the college was cleaned and fresh dried leaves were added by the members on 21st July,2018.The members were assigned duties week wise in groups to clean and maintain the vermicompost unit. As part of the Awareness towards Green Initiatives, Quiz was conducted to the members on 4th August, 2018 on the topic “Facts of Nature” in order to impart knowledge on nature. Campus cleaning was done by the members of nature club 11th August, 2018 wherein the members cleaned the campus to make it a plastic free zone. A video “Great Barrier Zone” was shown to the members on 25th August, 2018 by which the members learnt the life of colourful organisms in Coral Reefs.  The National Service Scheme (N.S.S.) focuses on the development of the personality of students through community service.The College runs 2 units, with each unit of 100 volunteers. The NSS provides programmes of leadership and service to the members. It effectively channels the energy and interest of the students to take up social, cultural and community development programmes. Agnesians deem it a privilege to be members of the NSS. As NSS members they have to put in 120 hours of work per year and work as volunteers for two consecutive years. A student who fulfils these conditions is awarded a certificate by the University. The Mangalore University reserves a few seats every year in the M.A. /M.Sc. / M.Com. / M.B.A. Degree Courses for students who have a record of service in the NSS. The NSS unit of our college comprises of 211 members and is divided into two units. On 18 June Ms. Nerissa of II BCom was elected as the NSS Secretary and Ms. Melrida of II BSc as the assistant secretary. On 21st June, 40 NSS Volunteers took part in the International Yoga Day celebration and Mr. Gopalakrishna Delampadi, Rajyotsava awardee, was the chief guest of the program. On 22 June, 2 NSS Volunteers attended a session on ‘SwachhaGelati’ conducted by Zilla Panchayat. The orientation program for the NSS volunteers was held on 23 June and NSS Program Officer Mrs. Anitha and Ms. Nerissa, NSS secretary addressed them. On 5 July, 25 NSS volunteers participated in Gaddheyalli Ondu Dinaat Konaje, Mangalore. 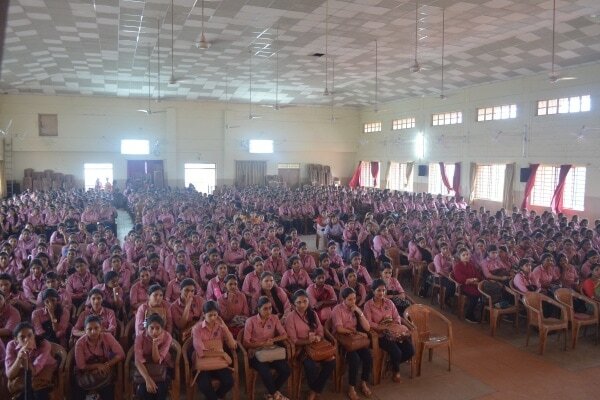 On 6 July, 34 NSS volunteers attended a seminar on Swachha Gelati at RoshniNilaya College, Mangalore. The formal NSS inaugural was held on 14 July and Dr. Sanjay Annarao, NSS Program Officer from University College was the chief guest. 4 NSS Volunteers took part in the leadership selection camp at Konaje from 17 July to 23 July. 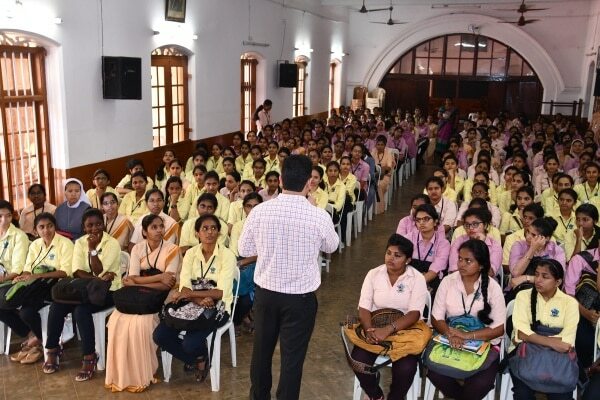 A talk on Drugs and its side effects was held on 21 July and Dr. Kavyashree HOD of Clinical Psychology, PG Centre, St. Agnes College and Ms. Ann Maria were the resource persons. On 4 August, 34 NSS volunteers were allotted 14 different schools to enlighten the high school girl students about personal and menstrual hygiene under Swachha Gelati organized by Zilla Panchayat. The NSS executive meeting was held on 6 August at 3.45 p.m. to apprise the members of the action plan for academic year 2018-19. Cleanliness Drivei.e. Campus cleaning was done by NSS volunteers on 8th August. NSS volunteers celebrated Aati Donji Dina on 11 August and the chief guest of the program was Dr. Jayanth, retired Chemistry professor of St. Agnes College.Under Swachthapakhwad 50 NSS volunteers visited a village named Kuthar and cleaned the village on 22 August. On 27 August, Intercollegiate NSS Fest ‘Aakrithi’ was conducted for the first time . The chief guest of the inaugural was Sr. M. Supriya AC, Principal of Carmel College, Modankapu. Around eight colleges participated and six different competitions were held. The chief guest of the valedictory was Mrs. Vineetha, NSS coordinator, Mangalore University. 2 NSS volunteers attended a one day camp for Republic Day Parade selection at Mangalore University on 22nd August. NSS Day was celebrated on 22 August and Mr. Dr. Uday Kumar, Former NSS Program Officer, St. Agnes was the Chief Guest. The annual NSS camp was help at Aided Uchila Bovi Higher Primary School, Someshwara, Uchila from 29th October to 2nd November, 2018. 106 NSS volunteers took an active part in the residential camp. NCC guides and provides a suitable environment for developing discipline, responsibility and dynamism among the students. It helps to develop courage, comradeship, leadership, secular outlook, spirit of adventure, sportsman-ship and ideals of selfless service to the society and the nation. The youth are motivated to take up a career in Armed Forces. The NCC unit of St Agnes College has 34 Army wing cadets and 6 Airwing cadets . This year we have received Independent Airwing unit of strength of 25. All the Army wing attended the annual training camp at Aloysious ,Mangalore and Air wing cadets attended at Alvas,Moodbidri . 3 Army wing cadets attended the National level Tal Sena Camp (TSC-I) at Manipal and two cadets further selected for TSC-II at Shimogha. Two Air wing cadets attended the National level Vayu Sainik Camp (VSC) at ,Belgum. The Army wing and Air wing cadets participated in the Independence Day parade in Nehru Maidan and Air wing won first place in the parade competition. Two Army wing cadets are selected for Republic Day Camp at Alvas Moodbidri. 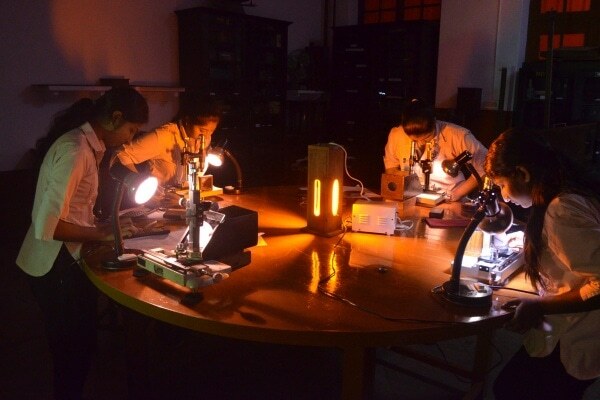 The forum helps to develop scientific temper among the students. It provides opportunities of leadership and organizational skills in science and motivates them to build service-oriented attitude towards the society. It also moulds the interest of students in science for undertaking research and extension activity. To develop scientific temper among the students. To provide opportunities of leadership and organizational skills in science and motivate to build service oriented attitude towards the society. To mould the interest of students in science for research and extension. The Science forum association has 46 active members who carry out their due responsibilities under the guidance of Dr. Saraswathi, B. S., Convener, Dept. of Chemistry and Ms.Ashwija K. Student incharge, III B.Sc. The students are divided into three groups to enable active participation in every activity performed during the regular E.C.A. hours and also during extension activities. A Seminar competition was conducted on “Life of a scientist” open for all the degree students on 9/8/2018 and 11 students participated in the competition. Mrs. Saramma and Ms. Smitha were the judges for the competition. Science Forum members displayed various items on the Science Forum notice board on regular basis. 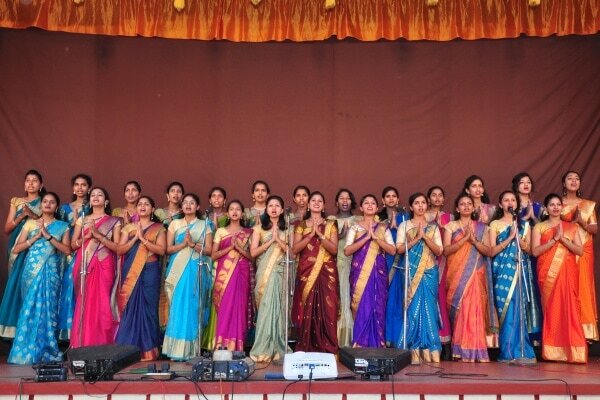 Society for the Promotion of Indian Classical Music and Culture among Youth is a Subchapter of the Mangalore Chapter. It creates awareness on our folk art forms and principles and objectives of cultural association. It helps to popularize Indian culture among our students and creates interest in them. 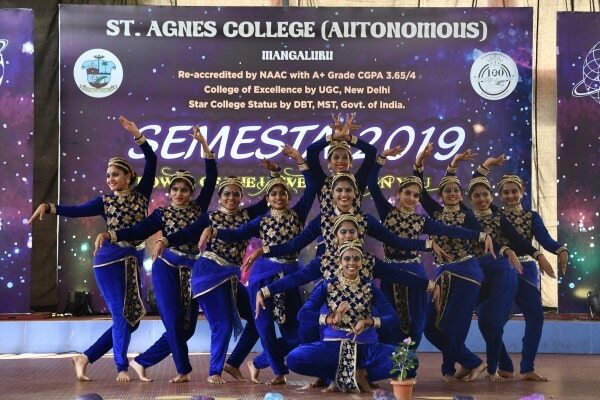 With the objective of educating our members and students of the college on different aspects of Indian culture, fine arts, especially music and dance, this year the students took up a notice board presentation on the theme “Indian folk musical instruments”. Seniors members of Cultural Association welcomed the juniors on 23nd June 2018 with a colorful program. Senior members exhibited their talents in the form of singing, dancing, acting etc. In order to provide an opportunity and scope for the exhibition of creativity and talent the cell organized a competition on “Innovative Indian dances ” on 21st July 2018. 16 groups participated. The competition brought out the creative talents of the students thereby enhancing the value of traditional Indian dances. On 1st September 2018 students had an exercise on “music dumb charades” and all the members participated in the program actively. Students are given opportunities to develop interest in the field of sports, improve team spirit and workout incentives leading to better participation in sports. The students are encouraged to maintain physical fitness and develop their personality. The members of the Sports Association were given Orientation regarding this Association by Mrs.Vasudha.S, co-ordinator; and the Sports Secretary Miss. Vijayashree. The members of sports association were briefed about the various activities that would be conducted during the academic year. Co-ordinator, Sports Secretary, and all sports Association students introduced themselves. Since the number of members in the association was more, the members were divided into 4 groups, having a leader and an assistant, so that it would be easy to conduct activities. Then students are allowed to discuss in the group. 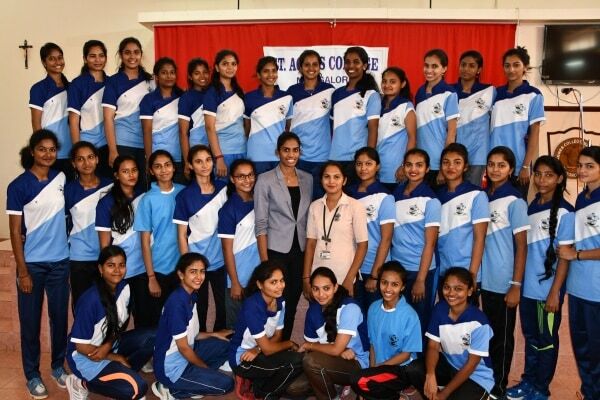 Guest Lecture was conducted for sports association Students on Motivation to participate in all sports related activities by Mrs. Sharyl Prethika Dean of Commerce. The students were instructed as to how to use the Gym and benefit from the exercises in the Gym and Zumba. They were advised to practice and continue the same. Quiz and Logo competition was conducted group wise for the students of the sports association. Each Group had to make two Logos of a sports brand, the best and unique Logo won the prize. Debate Competition was conducted group wise for the students of the Sports Association on the topic Opportunity given for women in the Sports Field. Basic exercises were taught by the co-ordinator and Sports Secretary to the Sports Association Students and Outdoor Games was conducted for the students. Students were allowed to play Games like Throw ball, Volleyball and Basketball in which they are Interested. All the members of the association took part in the indoor Group games conduced by the Association. The Red Cross Unit works for the promotion of health and hygiene, National Integration, avoidance of drugs and substance abuse, communal harmony through conflict resolution and eradication of illiteracy. The Youth Red Cross began its activities on June 23rd 2018 with an orientation programme for the newly joined members. 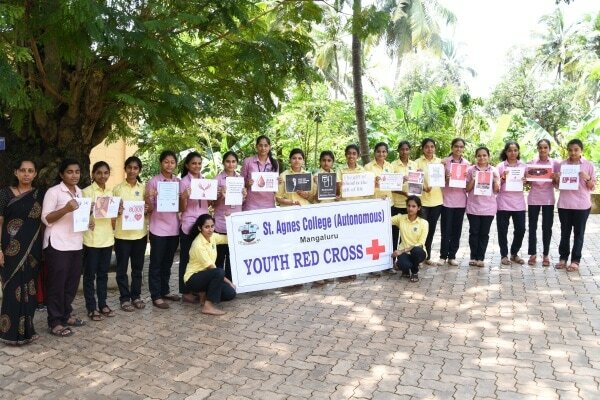 The Staff Coordinator Mrs.Prajwal Rao briefed the students about the origin and historical outline of Red Cross and motivated them to take part in all the activities of the Association. On 4th August 2018, the staff coordinator briefed the students on the importance of ‘international day against drug abuse and illicit trafficking’. Various aspects like types of drugs, their psychological effects on the youth due to drug abuse, various disorders associated with over usage of alcohol, nicotine, cannabis, tobacco, opium etc was explained to the students. The members learnt the Red Cross Prayer song and Welcome clap during the month of August which is mandatory to be followed during any official programme of Youth Red Cross. 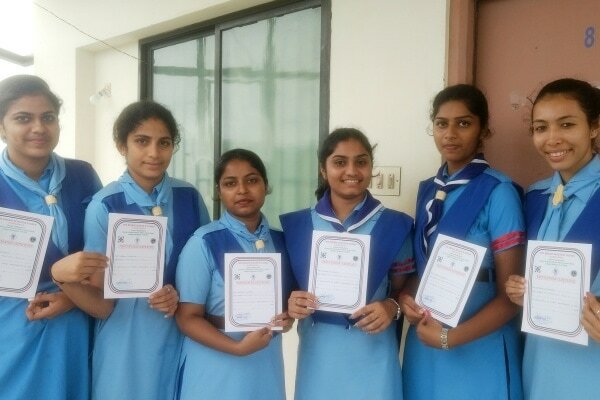 Slogan writing competition on the topic “Importance of Blood Donation” was organized for the members of the Cell and fifteen days time was given to submit their slogans(1st September 2018). Apart from the above mentioned activities, the members of the Cell were actively involved in group discussion, watching inspirational movies ,Seminar presentations, Role play on topics like Social Awareness, Care of the girl child,Health and hygiene etc. The Cell tries to eliminate the evils that beset young women on the campus and women in general and endeavors to alleviate the negative forces that confront women, both on the campus and in the city by creating awareness among the students to appreciate and respect their personal identity and status as women. It helps to empower students to develop their potential and learning skills and to bring about attitudinal changes among the students with regard to their rights and responsibilities. The forum aims to develop a positive self-concept in students by creating awareness on social issues and inculcating the spirit of social concern. The students-centered activities include personality and intelligence tests, street plays, group discussions, field visits, training in improving communication skills and personality development.These activities conducted by the forum help the students to build up their personality. Ice Breaking: Students had to introduce themselves in an innovative way; they were also randomly put into groups so they could know each other. Brain Games: Students were grouped and were given puzzles to solve. Talk on Assertiveness: The talk was given by Dr. Kavyashree of P.G Psychology Department she addressed the issue on how to face and act assertively when encountered by strangers in bus. Video Review: The videos were related to different Psychological problems wherein students had to review and give the highlights. Guest Lecture: Conducted on the topic Health and Hygiene by Mrs. Vidya Patali , Assistant Professor, Microbiology Department and two students of III MZC. They spoke about modes of transmission of diseases, harmful effects of microbes, benefits of micro flora, sewage treatment and effects of chemical products, personal hygiene and application of disinfection. Importance of Listening Skills: The topics covered were difference between listening and hearing, how miscommunication by hearing can lead to problems. The club aims to impart the joy of reading language and literature. It helps the students to hone spoken English and creative writing skills by conducting various language related activities. The Lit-Wit Literary and Western Dramatics Club has 88 members enrolled for the year 2018-19. The Club has conducted various activities for its members during the ECA hour like ice breakers, pictionary, jumbled up words, book review, salad bowl, mirror activity, freeze and identify, sausage game, bucket of water, etc. The students are trained in theatre, bhavageethe, Kannada typing using computer, debate and creative writing. Activities of Kannada Sangha was inaugurated on 15th July 2017, by Dr. R. Nagappa gowda, Professor SVP Kannada study centre Mangala Gangothri Konaje. 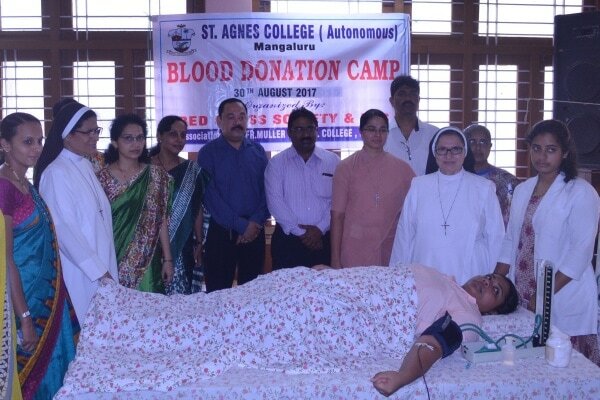 Principal of the college Dr. Sr. M. Jeswina AC presided over the function. Kannada Sangha organized a two day State level workshop in writing science articles in kannada, on 17th and 18th Auguest 2017. Well-known kannada science writer Mr. M. Abdul Reheman Pasha was the Resource person. 62 students from our college and 25 students from other colleges were participated. Karnataka science and technology promotion society, Govt. of Karnataka (KSTEPS) sponsored the program. Vachanasara Prachaaropanyasa Program organized on 5th December, 2017, collaboration with mangalore University Ambigara Chowdayya Pitha. 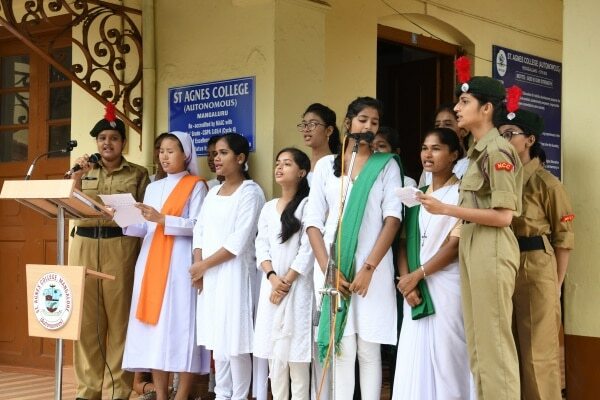 Dr. Vishwanath badikkana, Professor St. Aloysius College was the chief guest. Dr. Nagappa Gowda, Professor SVP Kannada study centre, Mangalore University was the resourse person.Dr. Sr. Jeswina AC Principal of the College presided over the function. One day state level Seminar on Yakshagana conducted on 26. 02. 2018. The program held in collaboration with Govt. First Grade College carstreet mangaluru, All India Radio, DR. dayananda Pai and Sri Sathisha Pai Yakshagana Adhyayana Kendra Mangalore University, Mangalagangothri. Prof. Chinnappa Gowda inaugurated the seminar. Dr. M. Prabhakara Joshi delivered Keynote address . 5 resource parsons taken the session. In the regular ECA classes training given on report writing to news papers, Drama acting, extempore speech, public speaking, creative writing and such. The students are encouraged to develop skills in Hindi Language like business communications, dramatics, TV/AIR programme Anchoring. An orientation was conducted by the staff and student coordinator on 23rd June, 2018. On 30th June,2018 students were trained with creative writing in Hindi . On 2nd July, 2018 ,group activity was conducted and the students were divided into groups by the staff and student coordinator. Pick and act was conducted on 4th August, 2018. On 1th August, 2018 Hindi debate was conducted. Students were trained how to do a debate in Hindi. On 25th August, 2018 Hindi Sangh conducted patriotic singing competition in connection with Independence Day and the best two groups were awarded with prizes. On 1st September, 2018 students pick and talk session was organized to improve Hindi speaking skills of the students. On 15th September, 2018 the staff coordinator conducted group activity for the students. Students who wish to appear for competitive exams such as IAS, IPS, IRs, KRPS, UPSC and S SSC are given orientation and motivation by experts. The Rangers Assocaition was started in St. Agnes College in the academic year 2007-08 with the motto of rendering ‘Service’. Students are given an opportunity to continue the guiding spirit and culture, promoting nation building activities with the Motto ‘Be Prepared’ for Service. It also helps them to bring about discipline, leadership qualities and render service to the society. The Mangaluru TWS initiative has been introduced in our College. 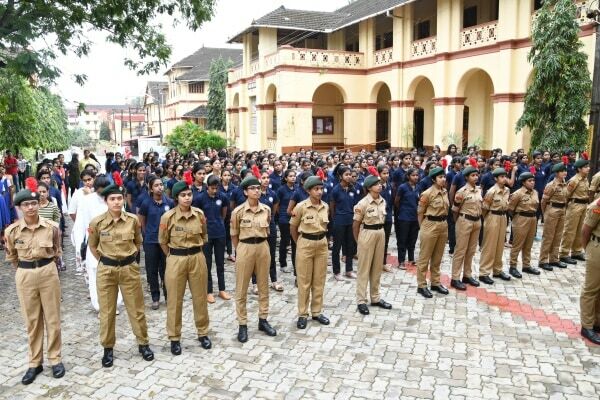 The students were trained in traffic signalling and the traffic control by the Traffic Police at the station in Pandeshwar, Mangaluru to spread over for a period of ten hours for two months. The TWS volunteers render services at St Agnes Institutions Bendore, Highland junction and Bendorewell Circle after class hours. The Human Rights Education Cell was started in the year 1999 to meet its objectives of education, awareness and guidance in the area of human rights. The cell studies and examine cases of human rights violation in the Campus and trains the interested group to facilitate intervention and take necessary action. The Cell organises programmes related to the issues and concerns of women and children rights. The College has introduced a community service activity with the three-fold objectives, i.e., Education, Awareness and Service. The students are involved in activities such as: Child Line Campaign; Girl Child Safety and Child Protection; Open House Programmes for the Locality; Programmes for Self-help Groups; Awareness on Social Evils; To enhance Empowerment of Women; Awareness on Clean and Safe Environment through Watershed Management, Solid Waste Management and Recycling the Papers.